With the BBC reporting that Nick Clegg is considering David Cameron’s offer to more or less implement Tory policy for no benefits, it’s depressing that some people in the UK still don’t fully understand what’s going on (typical response: “The Tories won so why aren’t they in power?”), why we need electoral reform, and why the Tories are so utterly desperate to retain our broken first-past-the-post system. The reason is shown in the above image, available on my Flickr page, with this version being in big-o-vision. Because the UK’s 650 Commons seats are all ‘winner takes all’, bigger parties have more seats than they would under a proportional system. In fact, in an election where the Tories got 34% of every seat’s vote and Labour and the Lib-Dems got 33%, the Tories would have every single seat in the Commons, meaning 66% of votes would be entirely wasted. That might sound crazy, but the election in 2005 wasn’t a million miles away from this, giving Labour a working majority with barely over a third of the vote. Today, we have a hung parliament, with the Tories narrowly missing out on a majority, despite only getting 36.1% of the vote. They claim this gives them a mandate to govern, due to being the biggest party. That entirely ignores the fact that 63.9% of voters clearly don’t want them in power, and that a majority of the UK would in theory accept a Lab/Lib coalition, since that takes into account 52% of the vote. If we had a proportional system, the Tories would have as few as 235 seats, and Labour would be down 70. 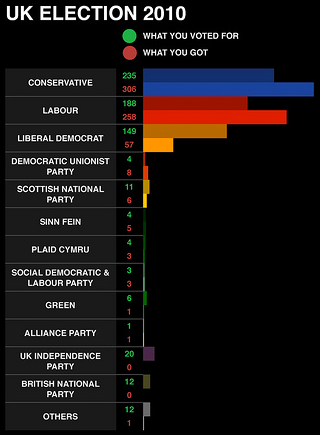 The Lib-Dems would jump from 57 to the 140s, and the SNP and Greens would also benefit. This would be a fairer system, since the Commons would represent the votes cast. However, this is also why the Tories won’t budge: they know they’d have almost no chance in the short-term of ever returning a majority. The downside to the system? UKIP would grab 20 seats and the BNP 12. However, in a democracy should we deny representation to those we don’t consider desirable (or, for that matter, the likes of the BNP a chance to show how truly awful they are, meaning they’d likely get no seats next time round)? If so, why not stop beating around the bush and ban every British political party apart from the Conservatives and Labour? Cameron’s offer to Clegg on electoral reform (a cross-party committe to look into it, with no guarantee of accepting the outcome) was a lot worse than Brown’s (a public referendum on electoral reform, although he did not specify proportional representation)… As Clegg himself said yesterday, the whole system needs reforming. Public funding of political parties (to do away with the scandals over donations, or one party spending millions to sway voter opinion) and genuine boundary changes (reducing the number of constituencies and MPs) would be at the head of my wish list. I’m not fussed about reducing the number of MPs, and I certainly wouldn’t want that to happen under the Tories, since they’d just redraw the boundaries to remove Lab/Lib support. I agree everything else should be a red line, however.